We use a specialized technique to guarantee your website is always available. The technique is called fail-over. Fail-over ? 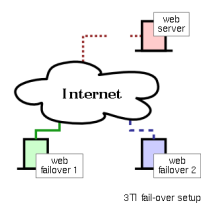 Usually, fail-over consists of 2 servers, a master and a backup server. If the master fails, the backup notices this and takes over until the master becomes available again. 3TI has taken this even further. Where this is normally used to protect against hardware failures of the master server, we've deployed a similar but improved setup with multiple Internet- connections. So if one of the Internet links becomes unavailable we can automaticaly switch from a server on one link to the backup server on a completely different connection. When others say they can build this, 3TI delivers it now, without extra cost.